It would probably be hard to imagine, but I have more than a couple of fabric scraps laying about my sewing studio. Buckets and bins and baskets full would be the best way to put it. I don’t think its an obsession, I think its more of a love affair. When I finish up a well loved favorite fabric and have that four by four inch scrap left how can I be so callous as to just dump it in the trash? So instead I will stash it away, certain one day I will want that little scrap. Today I pulled out those buckets and made the most adorable ipad sleeve. It is a one of a kind for sure. We have been playing with a new envelope style design, and I adore it. 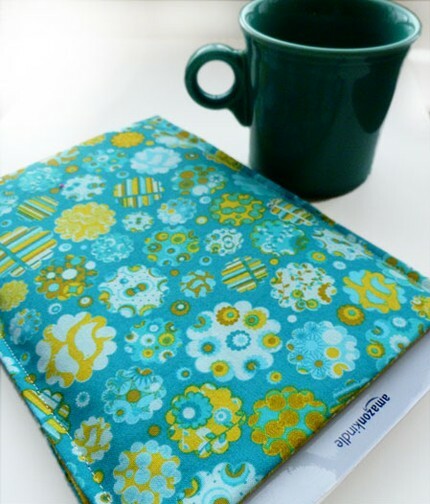 So for the lover of all things patchy and funky here is our newest ipad sleeve. iPad 2 is here! Did you get one? Now to dress it with a funky sleeve or cover. Did you get an ipad 2? I can’t imagine loving it more that I already love my ipad, but apparently… it’s new and improved. My ipad already has a great battery life, but the ipad 2 is even longer. Mine is light and easy to hold, but shockingly the ipad2 is lighter. Crazy technology! Here are a few newbies. I love the linen combos lately. Especially with the matching phone cases. 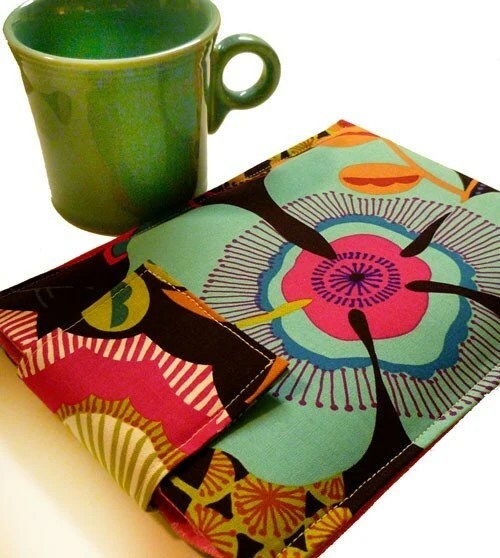 Fruit Salad - sleeves for the ipad, ipad2, iphone, ipod and various other phones sizes. Where can I find a cool funky ipod or phone case? 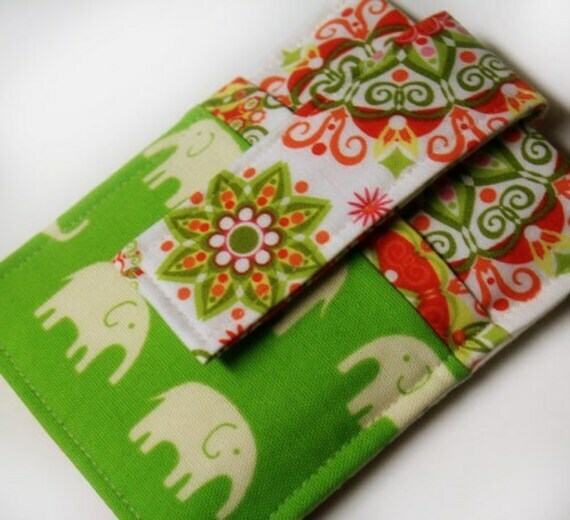 Look at this cute sleeve my daughter just created to fit your iphone, ipod, or other assorted cell phones. I adore the bright colors and the elephant print is too fun! This mix of fabrics might be the most fun she has created so far. I also love the kindle, nook, sony, etc. 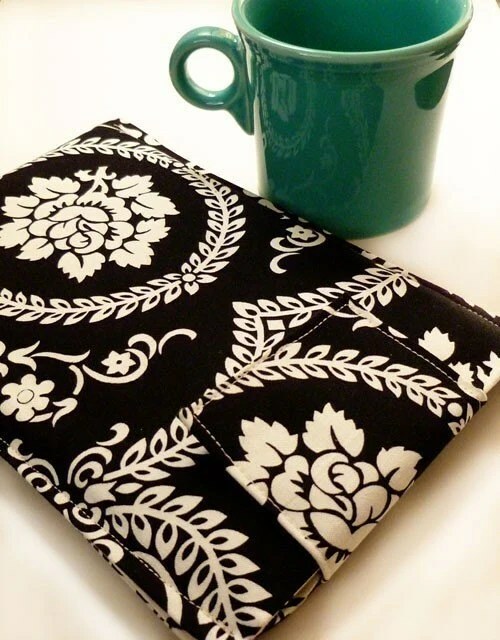 ereader sleeve that matches. And of course she is really tempting me with the ipad sleeve.… wonder if she would charge me? No need to go digging for your phone - it will be easy to find in this case. A cozy home for your ereader. The Daughter outdoes the Mother! Once again, the daughter has outdone the mother. Dont you hate love it when that happens. I may have mentioned, but I taught my daughter everything she knows. Not only that, but I also included an extremely smart brain when I gave her life! Is it not enought that she is younger, has better skin, hair, teeth and a tad, just a tad skinnier than me? When Corri started her etsy business I worked with her on photos, critiquing and inspiring and blowing her ego all over the place. (as if I was any sort of expert! ) Eventually, she wowed me with her pics. On to the Kindle Covers. We have been working together on operation kindle – nook – ereader – cell phone – ipod – iphone covers. A very serious undertaking. I thought the pics would be a snap. But not so. It has come down to this… Corri telling me to just mail her the covers for photos. Hmmph! 🙂 Really? Yes, Really! Look at some of her latest photos. I love the coffee cup.. just makes you want to take a break and sit down with a cup of coffee and read. Run over to her shop and see the other covers, sleeves, cases .. whatever you want to call them… for the ereaders. We customize them to fit nooks, kindles, and even ipads. Puppy Dogs N Polka Dots You will probably be able to see which pictures were mine, or at least the ones she has not redone! 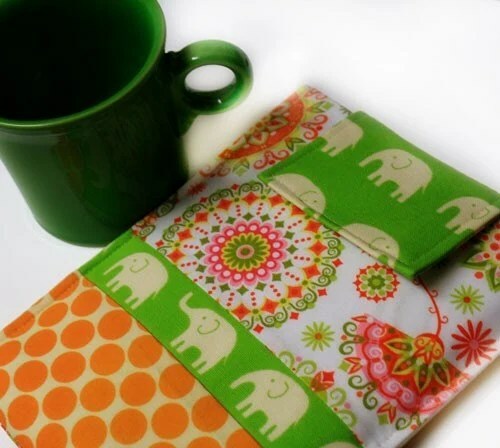 Where can I find a funky kindle – nook – ereader cover? Here, here, here! Kindle Cover - Sleeve in fun funky fabrics.